Borders and boundaries have become a source of concern for people worldwide. A border is a limit, a line that marks an end, keeps things in or out. As Robert Frost’s poem famously states, “Good fences make good neighbors.” But that is only one side of the story. A border marks not only an end but also a beginning on the other side, that which is not so familiar to us. The Spanish word for border is frontera, the French frontiere, in each case denoting an expanse beyond what we know, a new horizon of possibilities. A border is also a margin and a periphery–spaces outside the normal range of our vision that yield their own riches. As the website of our partner PEN America puts it: “The topic of borders and boundaries has been at the forefront of people’s minds, and it is important that these borders remain open, so that ideas, dreams, stories, and people can cross them easily, adding to the richness on either side.” In this three-part series, presented by The Dallas Morning News, PEN America, the Dallas Institute, and the Dallas Festival of Books and Ideas, we will examine positive aspects of borders. 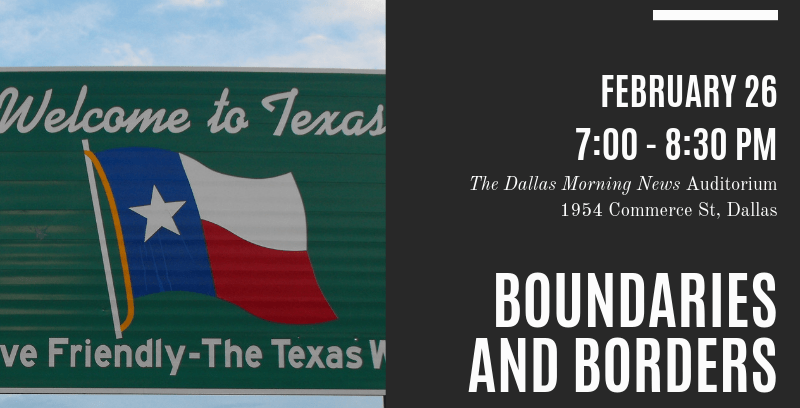 The first in the series will feature immersive investigative journalist and PEN America Member Anna Badkhen in conversation with The Dallas Morning News’s assistant managing editor for Features and Community Engagement Thomas Huang, focusing on the intersections of literature, storytelling, and journalism. Anna Badkhen has spent most of her life in the Global South. She has written six books including her most recent, Walking with Abel: Journeys with the Nomads of the African Savannah (Riverhead Books, 2015). She also contributes to Granta, The New York Times, Guernica, Nautilus, and Foreign Policy. Thomas Huang is assistant managing editor for The Dallas Morning News, an editing fellow at The Poynter Institute, and has worked at The News since 1993 as a reporter. He has successfully launched two Knight Foundation-funded projects—the Hispanic Families Network and Storytellers Without Borders.